Over the past year, there has been rising pressure on Facebook, Google and Twitter to account for how bad actors are exploiting their platforms. The catalyst of this so-called “tech-lash” was the revelation last summer that agents of the Russian government engaged in disinformation operations using these services to influence the 2016 presidential campaigns. The investigation into the Russian operation pulled back the curtain on a modern Internet marketplace that enables widespread disinformation over online channels. Questionable digital advertisements, social media bots, and viral Internet memes carrying toxic messages have featured heavily in the news. But we have only begun to scratch the surface of a much larger ecosystem of digital advertising and marketing technologies. 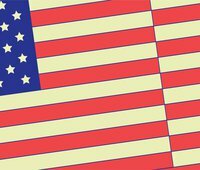 To truly address the specter of future nefarious interventions in the American political process, we need to broaden the lens and assess all of the tools available to online commercial advertisers. Disinformation operators in the future will replicate all of these techniques, using the full suite of platforms and technologies. These tools grow more powerful all the time as new advances in algorithmic technologies and artificial intelligence are integrated into the marketplace for digital marketing and advertising. The central problem of disinformation corrupting American political culture is not Russian spies or a particular social media platform. The central problem is that the entire industry is built to leverage sophisticated technology to aggregate user attention and sell advertising. There is an alignment of interests between advertisers and the platforms. And disinformation operators are typically indistinguishable from any other advertiser. Any viable policy solutions must start here. 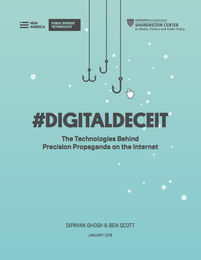 To inform and support this important public debate, this paper analyzes the technologies of digital advertising and marketing in order to deepen our understanding of precision propaganda. Behavioral data tracking. The lifeblood of digital advertising and marketing is data. An array of technologies operate unseen to the user, capturing every click, purchase, post and geolocation. This data is aggregated, connected with personal identifiers, and built into consumer profiles. This data helps disinformation operators derive the precisely targeted audiences that respond to particular messages. Online ad buying. The market for targeted online advertising drives sentiment change and persuasion. The most sophisticated systems enable automated experimentation with thousands of message variations paired with profiled audience segments. This precision advertising helps disinformation to reach and grow responsive audiences and to drive popular messages into viral phenomenon. Search engine optimization (SEO). There is a multi-billion dollar industry dedicated to optimizing search engine results by reverse engineering the Google search page rank algorithm. Disinformation operators use techniques known as “black hat SEO” to trick the algorithm and dominate search results for a few hours of the news cycle before Google corrects the distortion. Social media management services (SMMS). A new kind of digital marketing company sits at the intersection of machine learning algorithms and advertising technology. The SMMS offers advertisers a fully-integrated solution that pre-configures messages for different target audiences across multiple media channels simultaneously and automatically. It is a finely tuned disinformation machine for the precision propagandist. Artificial intelligence in marketing. Machine learning algorithms are already integrated into targeted advertising platforms and complex data analytics. Stronger forms of AI will be available in the near term. These advances will greatly increase the potency of disinformation operations by enhancing the effectiveness of behavioral data tracking, audience segmentation, message targeting/testing, and systemic campaign management. Our paper concludes with a series of recommendations to guide corporate reform, consumer empowerment and new public policy development. Current efforts to promote transparency in the advertising ecosystem are important steps. But these are only the first moves in a long and difficult challenge. We offer a set of principles to guide the path forward as well as starting points for potential regulatory intervention. These include changes to election law, data privacy protections, and competition policy. The nature of this crisis in media and democracy requires an ambitious approach to reform from Silicon Valley C-Suites to Capitol Hill to the handsets of everyday internet users. The American political resilience has through the ages hinged on our implicit commitment that markets must take a backseat to democracy.